I've been looking all day for an easy way to have a door open by just clicking it, but I haven't come up with anything that works. 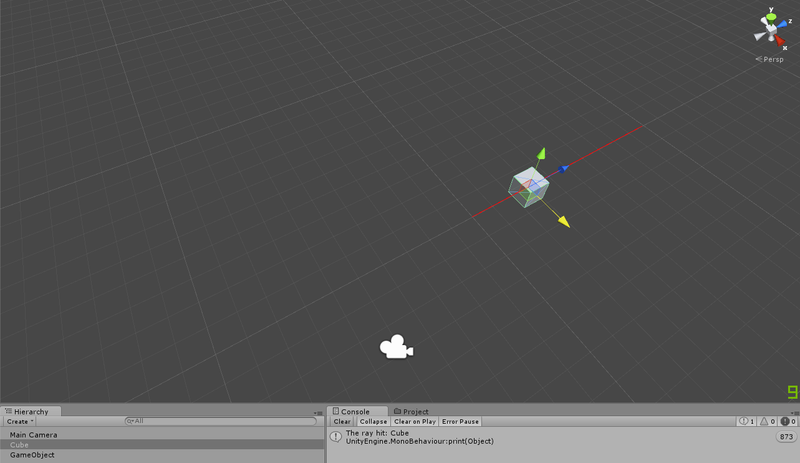 I am a student and I still get quite confused when it comes to C# code, but especially when it comes to Unity itself, I tend to completely lose track of how I'm supposed to do things. Using an animation: I've watched this video tutorial, but I can't get the door out of automatically starting its animation. Using normal clicks to simply destroy the door: I got this to work, however it's not the result I really want, and you'd also have to click the door with your actual mouse, not with the center point of the camera. Using Raycasts: this is most likely the way I want it to be done in the end, but the problem is, I don't understand Raycast, Vector3, Quaternion and those things at all. The rotation works the way I want it to, but apparently it's necessary to scale this cube to cover the entire door, otherwise clicking the door itself won't work to open it. I'm looking for someone who'd have the time to explain to me how I would have to use Raycasting in order to get a door to rotate -90 degrees on the Y axis, and if it's necessary, how to scale a cube that's parent of a door, so that it actually covers said door entirely. I hope my explanation is clear enough, it's my first time on this forum, and I'm Belgian, so that should explain any grammatical or spelling errors. I duplicated that animation and called it CloseDoor then swapped the frames over so the first frame becomes the last frame and the last becomes the first. 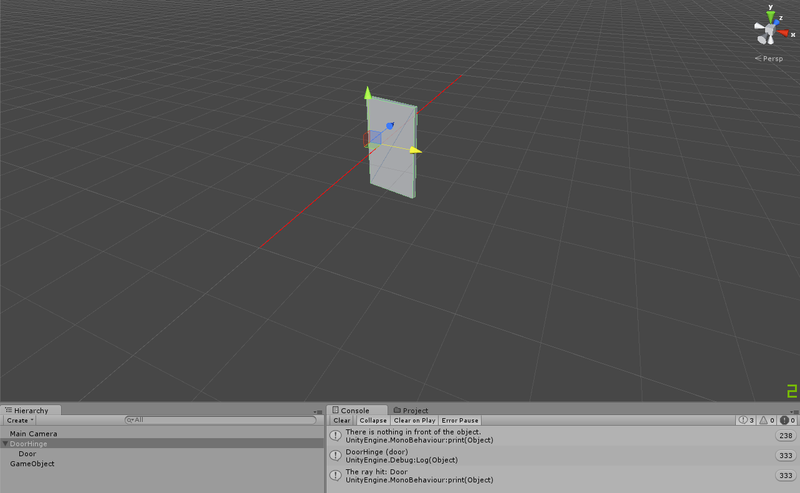 I then added the animations to the "door" Cube and added this script to it. When I click on the door it opens and once the animation time finishes I can click it again to close it. Good description of raycasting @$$anonymous$$ownstream but I'm not convinced @Sugar Mommy needs raycasting, OnMouseUp will do all the heavy lifting for a GamwObject and mouse clicks. Still we've given them options, which is good. Thanks for the help, I got it to work now! Hi @Sugar Mommy as this is your first question just some advice on Unity Answers. You should really tick the answer that helped you the most. It lets people know its been answered so it stops people wasting time providing new answers. It can also help people with similar issues, on top of that it also gives both the answerer and you some karma points. 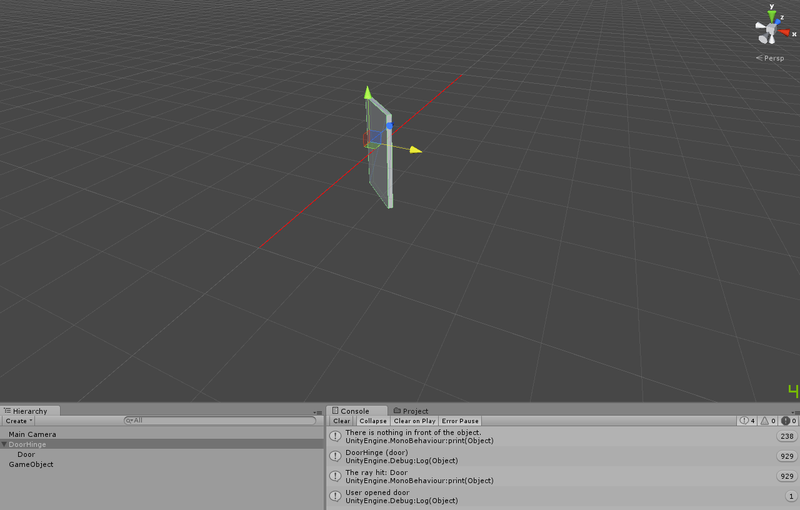 MissingComponentException: There is no 'Animation' attached to the "door3" game object, but a script is trying to access it. You probably need to add a Animation to the game object "door3". Or your script needs to check if the component is attached before using it. Raycast works by taking a vector from a position and checking if there's a collider in the path of that vector, basically like a bullet. You can then use the data in the raycasthit variable type to do different operations with the knowledge that you hit something, in our bullet analogy: apply particle effect, hit sound and a decal for bullet hole. What it does is cast a ray forwards, it then notifies if a collider is or isn't caught in the ray; see pictures below. 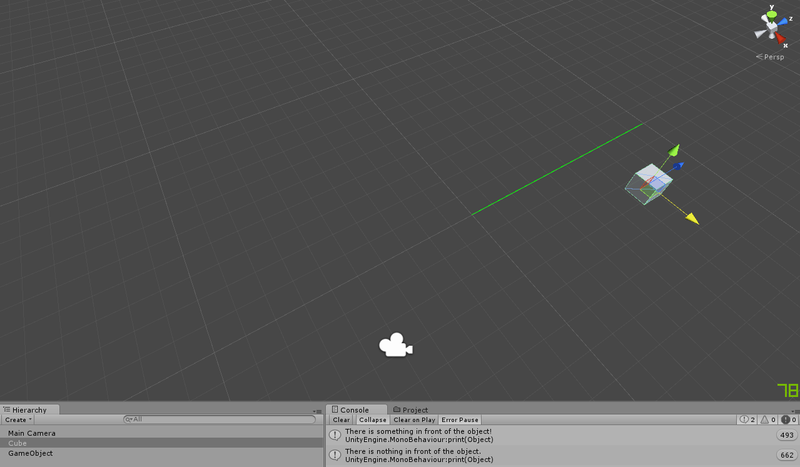 I used Debug.DrawRay to visualize the ray itself to you. From a raycast hit TYPE you can detect what was hit. Remember to set pivot mode to pivot, instead of center.. nearly confused myself there. 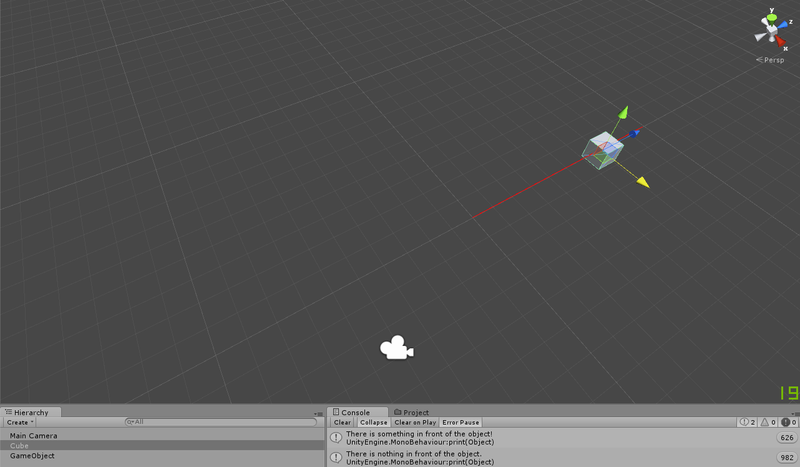 If you were having trouble resizing the collider then either you're not setting the collider size in the collider inspector or you have the objects parented the wrong way around is my guess. That clears up a lot! Thank you very much!